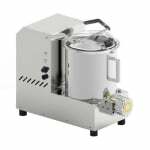 The Univex UPASTA pasta mixer and extruder can hold 8.8 pounds of dough and has a 21.1-quart bowl. In an hour, it can produce 17.6 pounds of pasta, and the unit's planetary spiral mixer quickly mixes pasta dough ingredients down. With a transparent plexiglass lid, operators can keep an eye on the pasta, while extruder cleaning is simplified because the bowl and spiral are removable. This unit is compatible with 14 pasta dies that shape different types of pastas; these pieces are sold separately. Can produce 17.6 lbs. per hr.